Set within spectacular private grounds with access via private driveway off Upper High Street, Cefn Coed, The property benefits gated access to an exceptionally large driveway, with enough space to accommodate multiple vehicles. 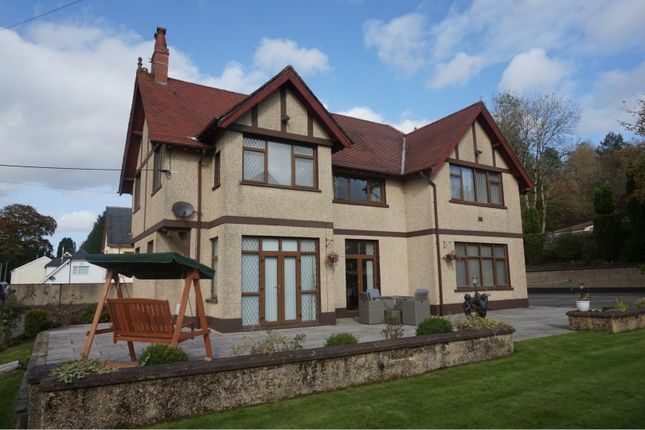 The accommodation briefly comprises to ground floor, lounge, sitting room, large kitchen/diner, study, utility and WC. From the Hallway via an impressive staircase to first floor briefly comprising of a family bathroom and five bedrooms with master bedroom having an en-suite shower room. Also from the hallway stairs leads down to a basement cellar. With large patio sitting areas to side and front with well maintained lawns, perfect for bbq's and events. To the rear theres a large garage with electricity supply. The location offers not only easy access to local village amenities, but link roads to Brecon and major motorways ideal for commuting. Viewing is recommended to appreciate size and grounds and the character of this detached Executive family home. Double glazed door to side. Double glazed door to rear. Door to hallway. Tiled flooring. Painted walls. Feature staircase to first floor. Door to stairs leading to basement cellar. Carpet flooring. Dado rail. Painted walls. Coved and painted ceiling. Two double glazed windows to side. Feature fire surround with fire. Central heating radiator. Double glazed French doors to front patio. Coved and painted ceiling. Painted walls. Dado rail. Two double glazed windows to side. Double glazed window to front. Feature marble fire grate. Central heating radiator. Coved and painted ceiling. Painted walls. Dado rail. Double glazed French doors to front. Feature fire surround with inset fire. Carpet flooring. Painted walls. Coved and painted ceiling. Dado rail. Low level WC. Wash hand basin. Carpet flooring. Fitted with a range of matching wall and base units with complimentary worktop preparation surfaces. Integrated dishwasher, oven and hob. Space for fridge freezer. Two central heating radiators. Tiled and painted walls. Tiled flooring. Double glazed door to front. Double glazed windows to sides and rear. Skylight window to rear. Double glazed window to side. Base units. Plumbing for automatic washing machine. Tiled flooring. Double glazed window to rear. Two central heating radiators. Carpet flooring. Cupboard housing boiler. Access to bedrooms and bathroom. Painted walls and ceiling. Double glazed window to front. Fitted wardrobes. Feature fire surround with fire set into an alcove with spotlights above. Access to en-suite shower room. Carpet flooring. Painted walls and ceiling. Double glazed window to front. Fitted wardrobes. Central heating radiator. Carpet flooring. Painted walls and ceiling. Double glazed window to front and side. Fitted wardrobe. Central heating radiator. Carpet flooring. Painted walls and ceiling. Double glazed window to side. Central heating radiator. Carpet flooring. Painted walls and ceiling. Double glazed windows to side and rear. Fitted wardrobes. Central heating radiator. Carpet flooring. Painted walls and ceiling. White suite comprising of a bath. Double shower. Low level WC. Pedestal wash hand basin. Central heating radiator. Carpet flooring. Central heating radiator. Double glazed window to rear. Tiled walls. Shower cubicle. Low level WC. Wash hand basin. Double glazed window to side. Tiled flooring. Painted and tiled walls. Central heating radiator. Gated access to a sweeping driveway allows private parking for multiple vehicles. The property has large patio sitting areas to side and front with well maintained lawns, perfect for bbq's & events. To rear of the property is a large garage with electricity supply.